Remind Me To What? 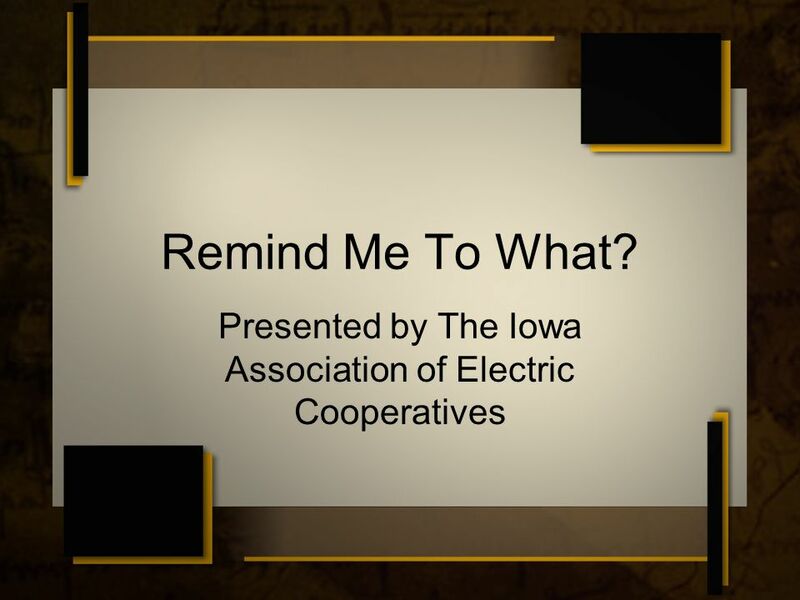 Presented by The Iowa Association of Electric Cooperatives. 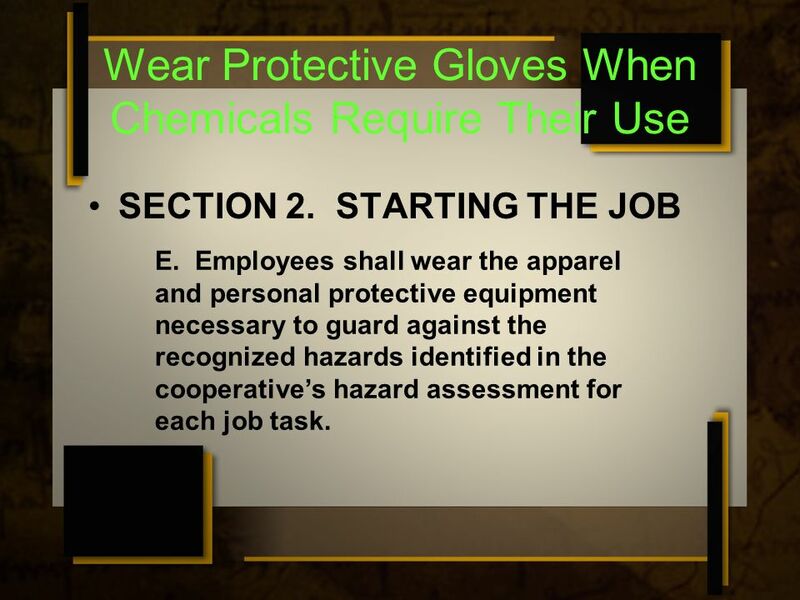 2 Wear Protective Gloves When Chemicals Require Their Use SECTION 2. 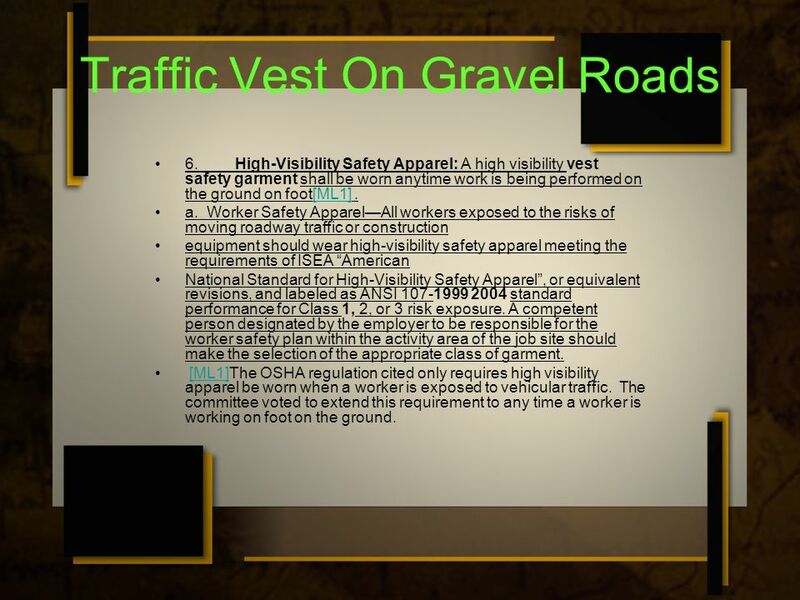 STARTING THE JOB E. Employees shall wear the apparel and personal protective equipment necessary to guard against the recognized hazards identified in the cooperatives hazard assessment for each job task. 3 Keep Basket and Boom Clean I. INSPECTION OF THE AERIAL DEVICE 3.Frequent Inspection and Test. 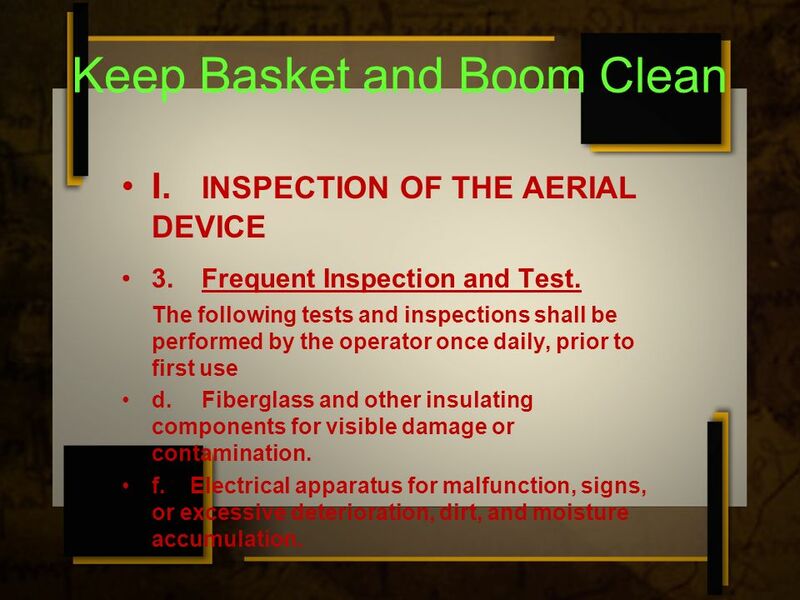 The following tests and inspections shall be performed by the operator once daily, prior to first use d.Fiberglass and other insulating components for visible damage or contamination. f. Electrical apparatus for malfunction, signs, or excessive deterioration, dirt, and moisture accumulation. 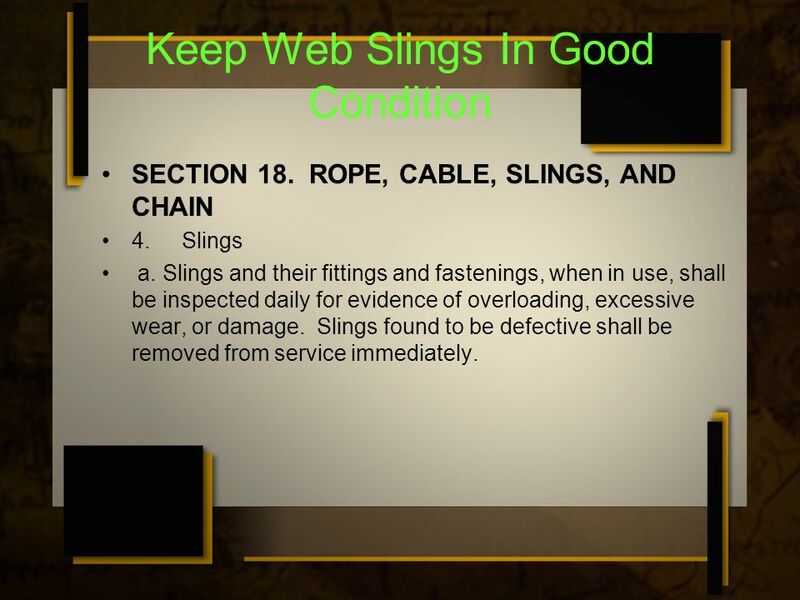 4 Keep Web Slings In Good Condition SECTION 18. ROPE, CABLE, SLINGS, AND CHAIN 4.Slings a. Slings and their fittings and fastenings, when in use, shall be inspected daily for evidence of overloading, excessive wear, or damage. Slings found to be defective shall be removed from service immediately. 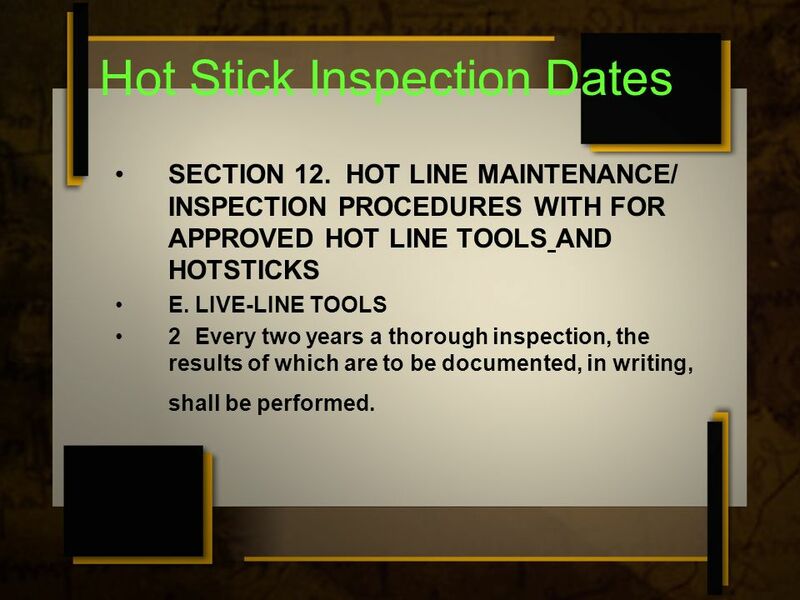 5 Hot Stick Inspection Dates SECTION 12. 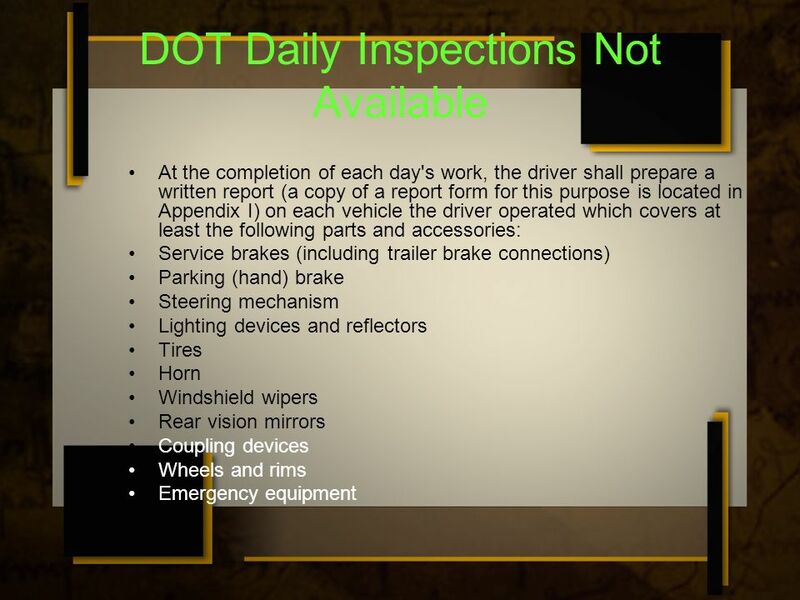 HOT LINE MAINTENANCE/ INSPECTION PROCEDURES WITH FOR APPROVED HOT LINE TOOLS AND HOTSTICKS E.LIVE-LINE TOOLS 2Every two years a thorough inspection, the results of which are to be documented, in writing, shall be performed. 6 Using A Personal Ground For A Energized Jumper SECTION 33. WORKING DIRECTLY ON ENERGIZED CIRCUITS WITH RUBBER GLOVES AND RUBBER SLEEVES 8.Cover-Up f. Circuits SHALL be opened and closed using approved live line tool methods. 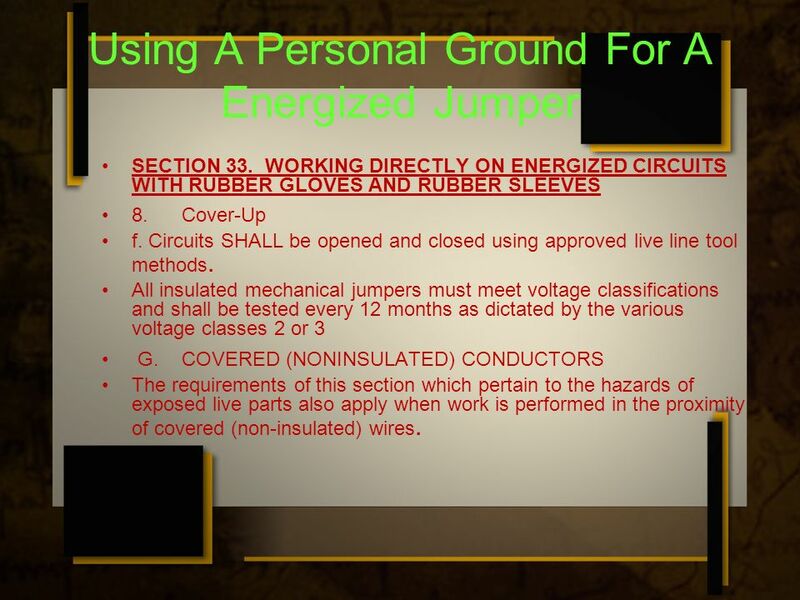 All insulated mechanical jumpers must meet voltage classifications and shall be tested every 12 months as dictated by the various voltage classes 2 or 3 G.COVERED (NONINSULATED) CONDUCTORS The requirements of this section which pertain to the hazards of exposed live parts also apply when work is performed in the proximity of covered (non-insulated) wires. 7 Safe Removal of OCR Jumpers There cant be a safety rule for every job procedure. 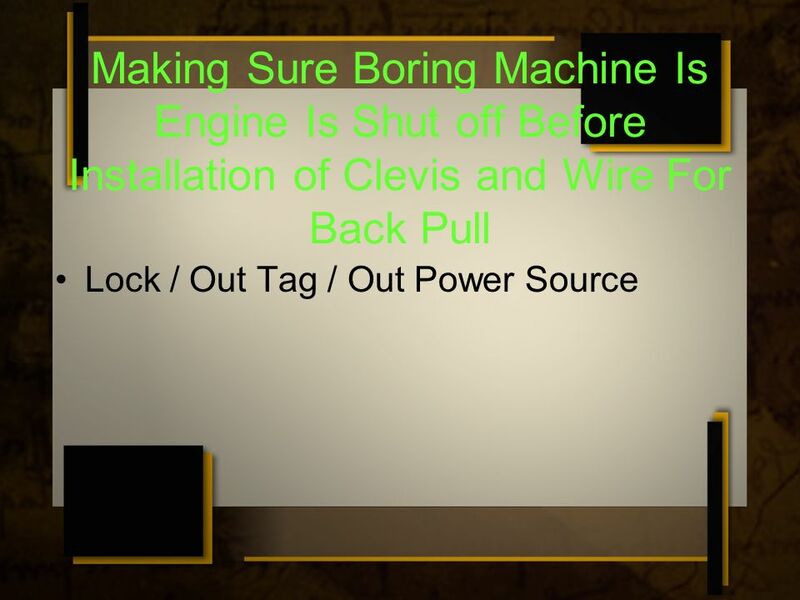 What is covered during your job briefing for removal of a single phase oil circuit breaker for maintenance? 9 What Will It Take To Get The Handline Back Out? What type of jobs require a hand line today? Where would a person benefit from using a hand line? 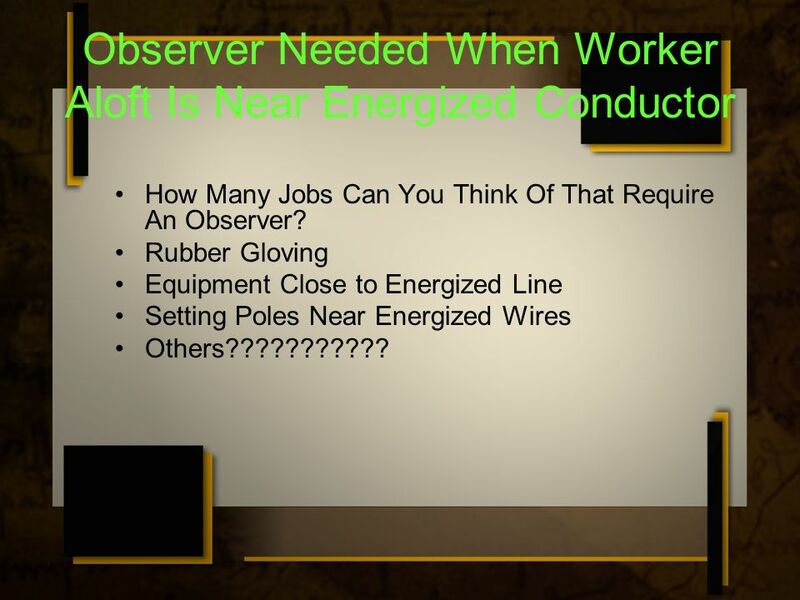 11 Observer Needed When Worker Aloft Is Near Energized Conductor How Many Jobs Can You Think Of That Require An Observer? 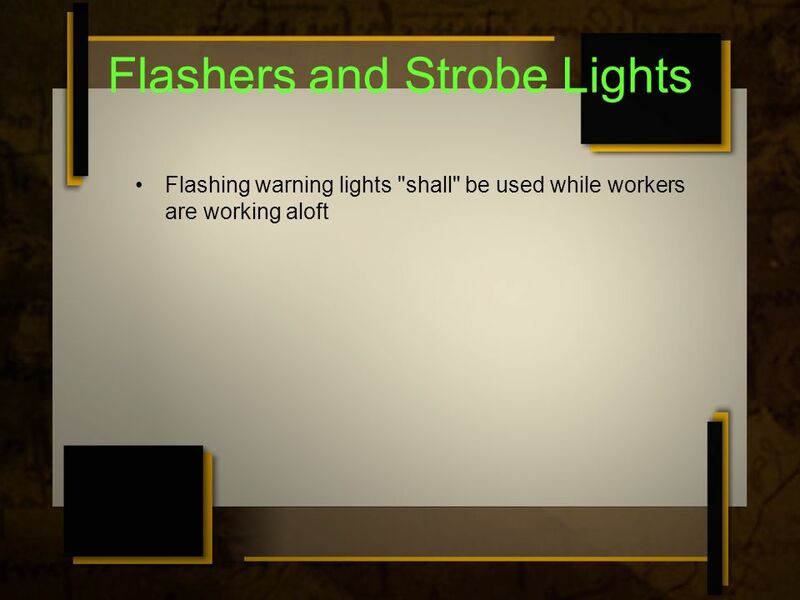 Rubber Gloving Equipment Close to Energized Line Setting Poles Near Energized Wires Others??????????? 13 Sleeves Not Worn Within The Approach Distance SECTION 4. RUBBER GLOVES AND SLEEVES 1.When necessary to get within reaching or falling distance of energized lines or equipment, the hands shall be protected by tested rubber gloves with leather protectors, and the arms protected with rubber sleeves. 6. 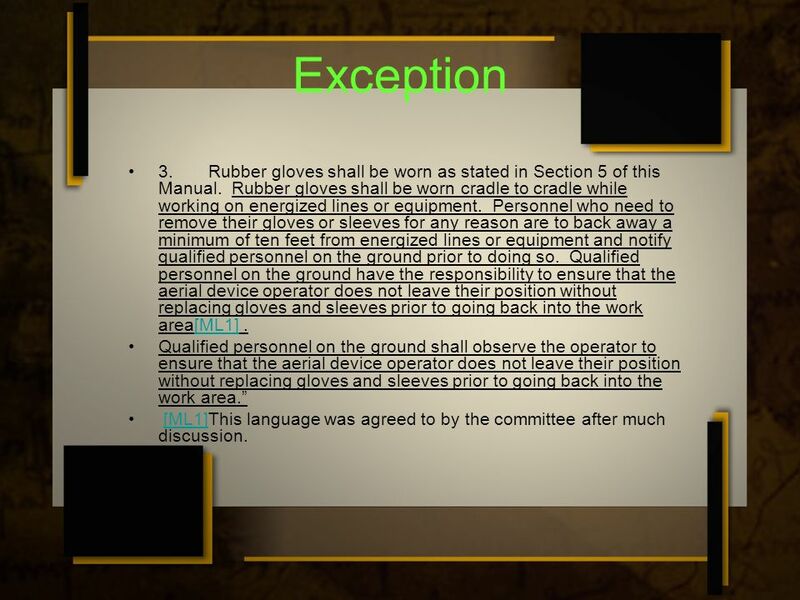 If the employee is to be insulated from energized parts by the use of insulating gloves, insulating sleeves shall also be used. 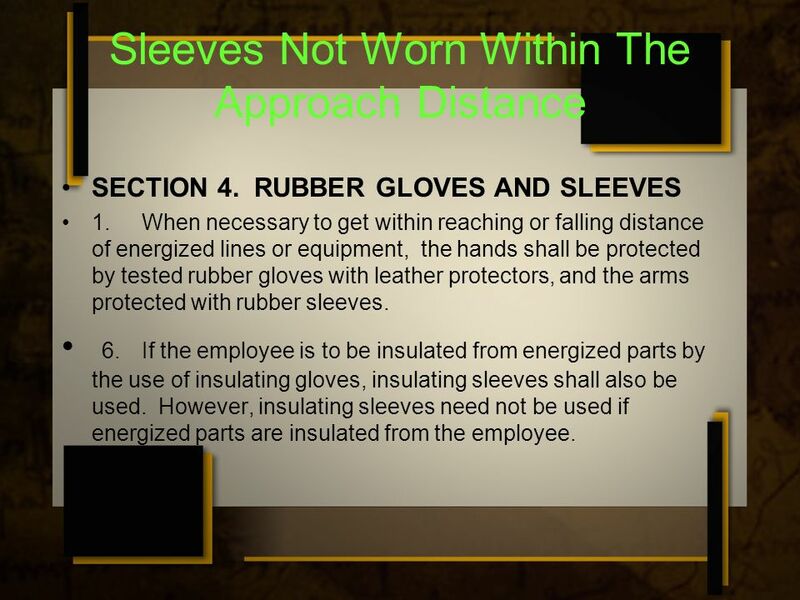 However, insulating sleeves need not be used if energized parts are insulated from the employee. 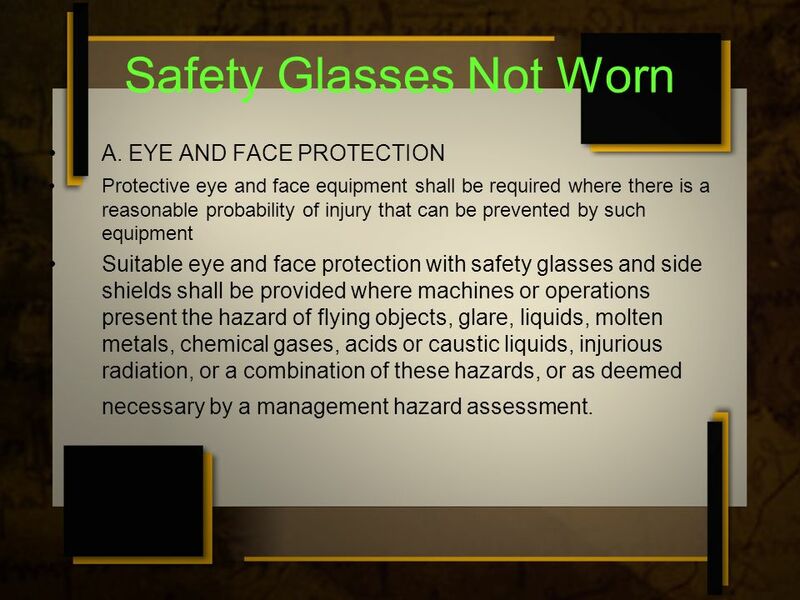 16 Safety Glasses Not Worn A.EYE AND FACE PROTECTION Protective eye and face equipment shall be required where there is a reasonable probability of injury that can be prevented by such equipment Suitable eye and face protection with safety glasses and side shields shall be provided where machines or operations present the hazard of flying objects, glare, liquids, molten metals, chemical gases, acids or caustic liquids, injurious radiation, or a combination of these hazards, or as deemed necessary by a management hazard assessment. 19 Chaps and The Chain Saw C.USE OF CHAIN SAWS 1.Chain saw operators shall: b. Follow manufacturer's instructions as to operation, personal protective equipment, and adjustment. (protective chaps required for chain saw operation) c.Wear protective chaps. 22 Lack Of Hearing Protection Wherever it is not feasible to reduce the noise levels or the duration of exposures to those specified in the following table, approved ear protective devices shall be provided and used to reduce sound levels within the levels of the table. 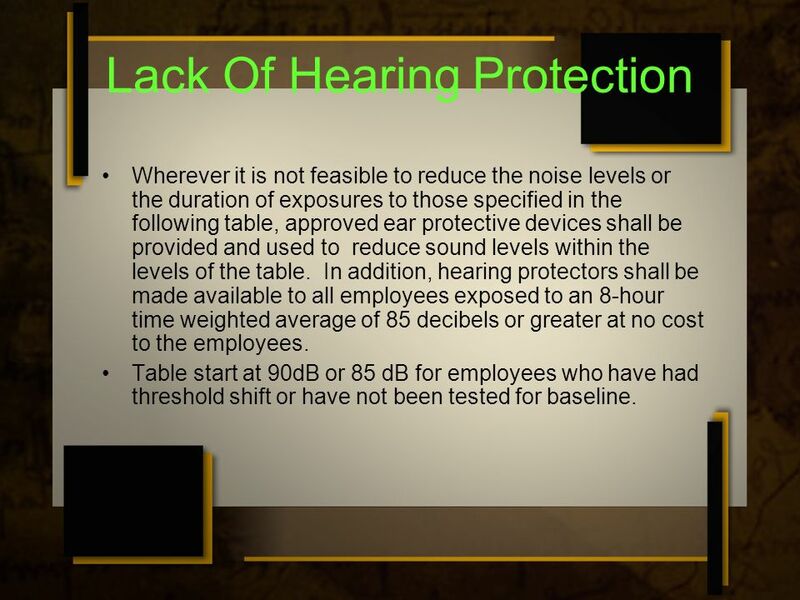 In addition, hearing protectors shall be made available to all employees exposed to an 8-hour time weighted average of 85 decibels or greater at no cost to the employees. Table start at 90dB or 85 dB for employees who have had threshold shift or have not been tested for baseline. 23 Test Dates Out On Rubber Goods All rubber cover-up equipment shall be dielectrically tested every 12 months, Class 2 rating up to 17,000 volts and Class 3 cover up 17,000 through 26,500. 25 Conductor Not Properly Covered While Rubber Gloving On single/multi-phase exposure work, enough cover-up material shall be used so that the employee or the longest conductive object he or she may handle can not simultaneously breach the electrical components or difference of potential. 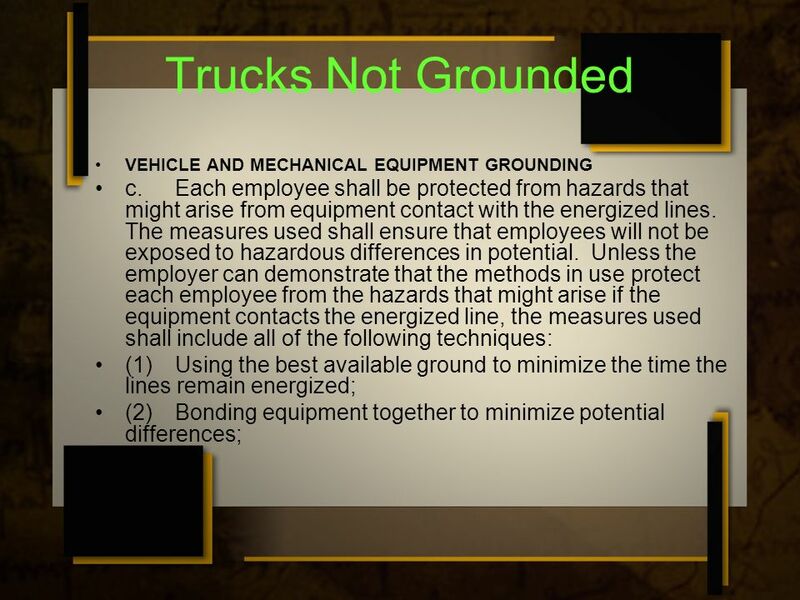 30 Temporary Truck Ground Installed Shallow All temporary driven grounds shall be placed in accordance to the 25 foot rule. 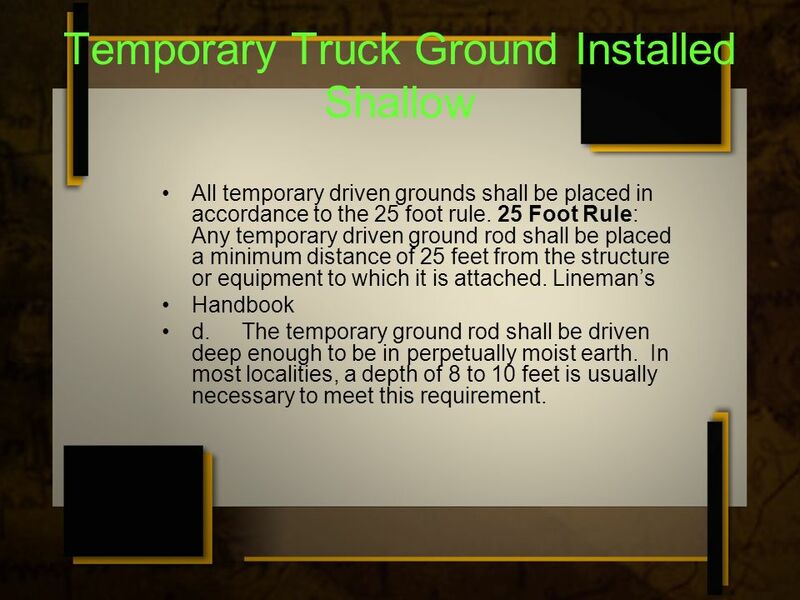 25 Foot Rule: Any temporary driven ground rod shall be placed a minimum distance of 25 feet from the structure or equipment to which it is attached. 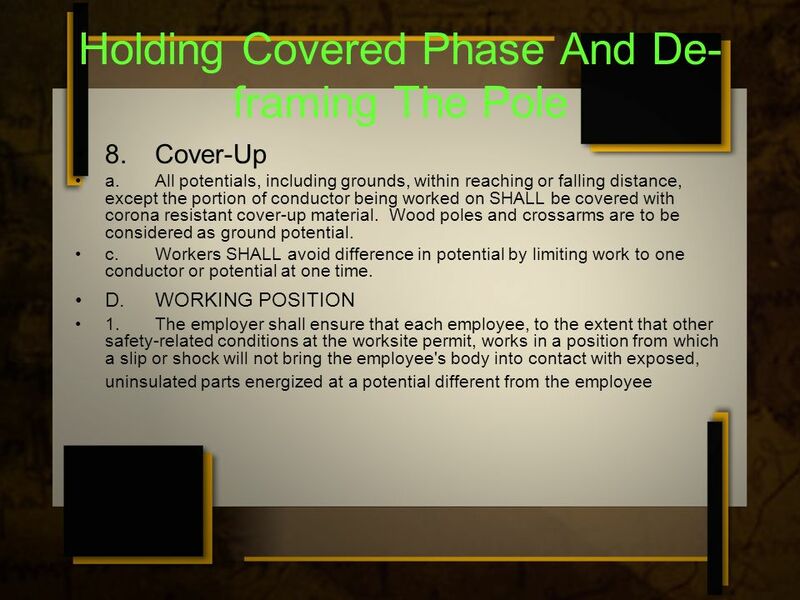 Linemans Handbook d. The temporary ground rod shall be driven deep enough to be in perpetually moist earth. 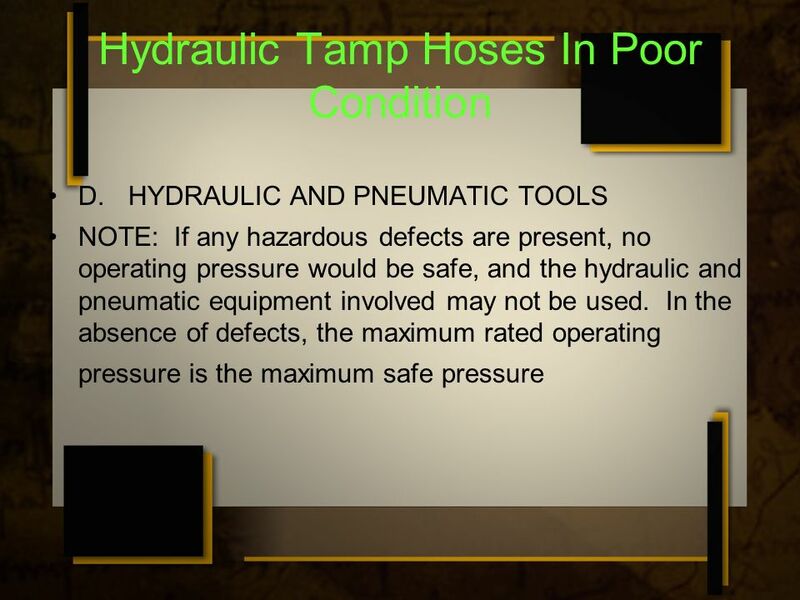 In most localities, a depth of 8 to 10 feet is usually necessary to meet this requirement. 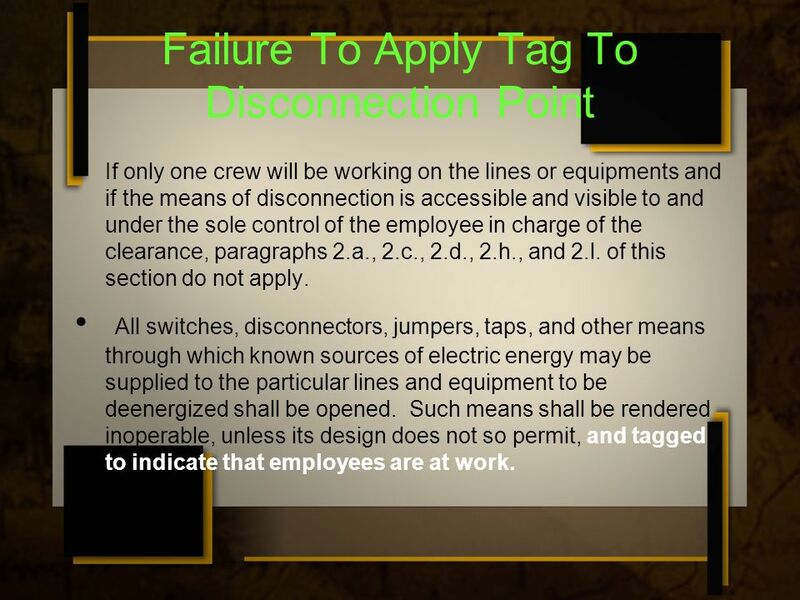 31 Failure To Apply Tag To Disconnection Point If only one crew will be working on the lines or equipments and if the means of disconnection is accessible and visible to and under the sole control of the employee in charge of the clearance, paragraphs 2.a., 2.c., 2.d., 2.h., and 2.l. of this section do not apply. 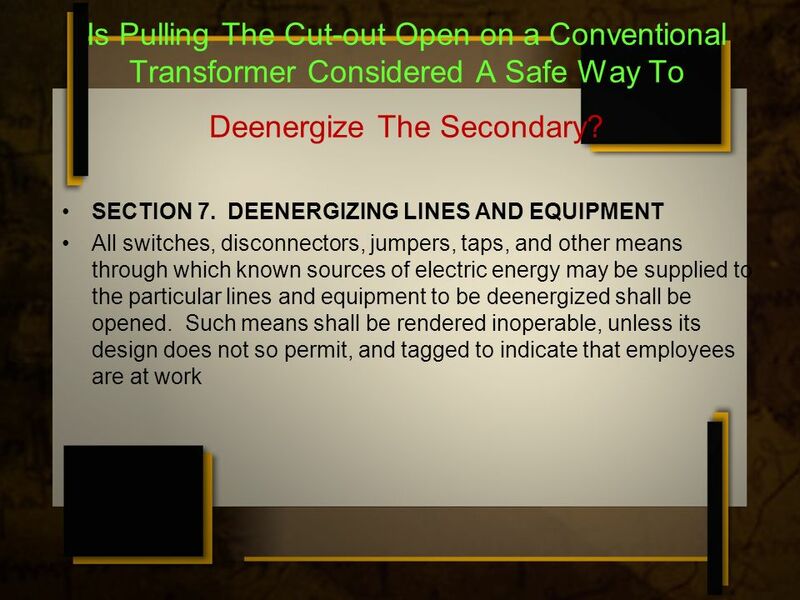 All switches, disconnectors, jumpers, taps, and other means through which known sources of electric energy may be supplied to the particular lines and equipment to be deenergized shall be opened. 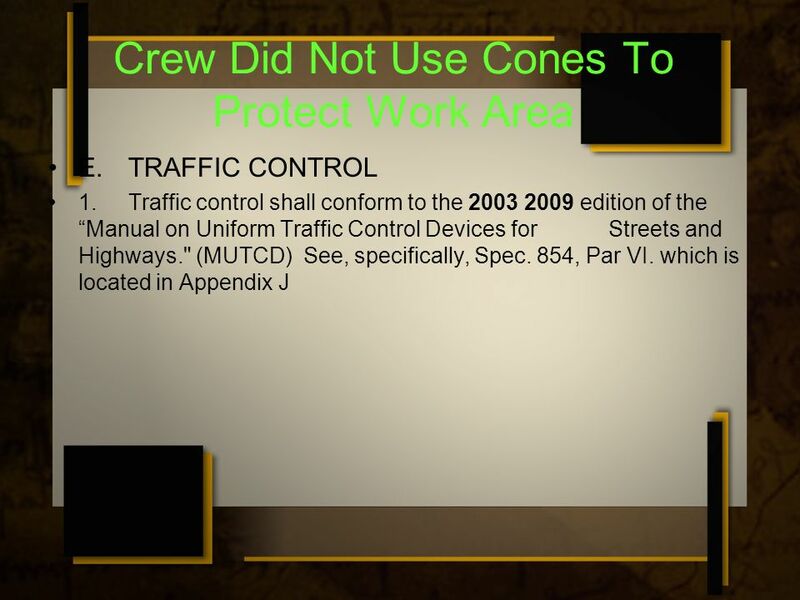 Such means shall be rendered inoperable, unless its design does not so permit, and tagged to indicate that employees are at work. 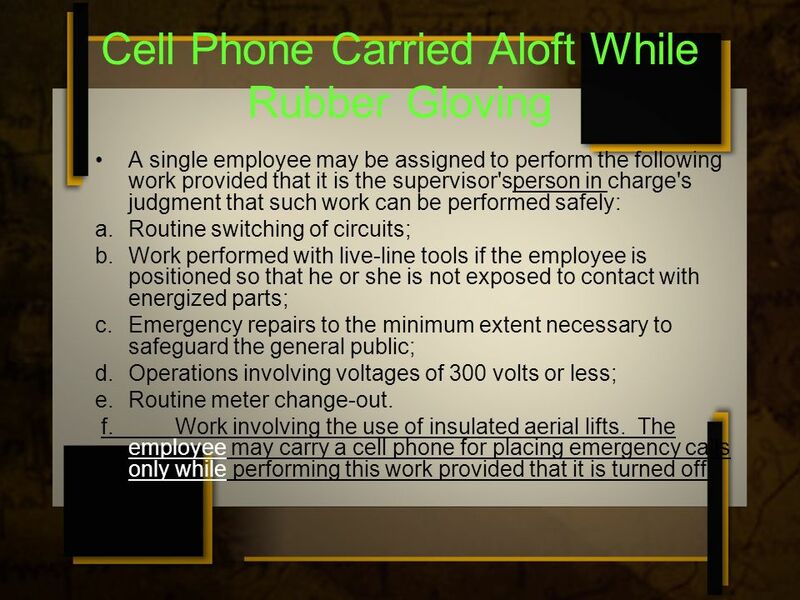 32 Cell Phone Carried Aloft While Rubber Gloving A single employee may be assigned to perform the following work provided that it is the supervisor'sperson in charge's judgment that such work can be performed safely: a.Routine switching of circuits; b.Work performed with live-line tools if the employee is positioned so that he or she is not exposed to contact with energized parts; c.Emergency repairs to the minimum extent necessary to safeguard the general public; d.Operations involving voltages of 300 volts or less; e.Routine meter change-out. f. Work involving the use of insulated aerial lifts. The employee may carry a cell phone for placing emergency calls only while performing this work provided that it is turned off. 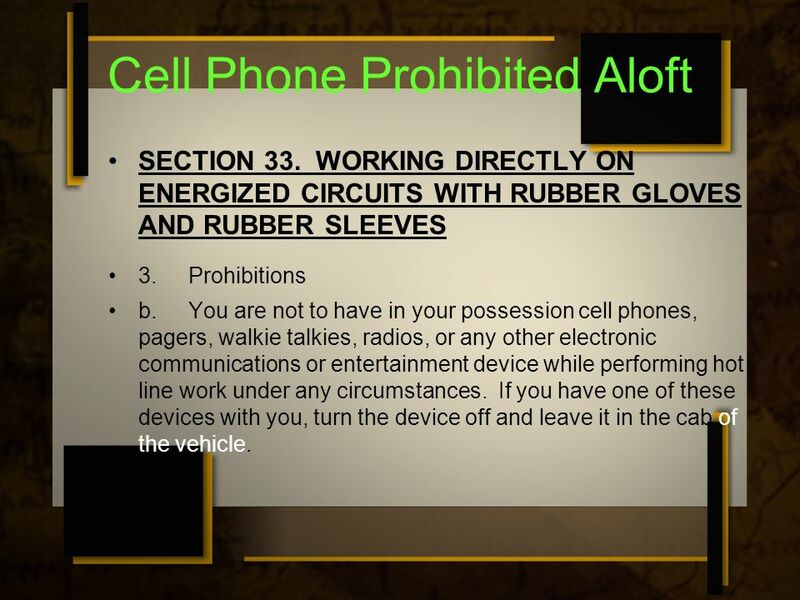 33 Cell Phone Prohibited Aloft SECTION 33. 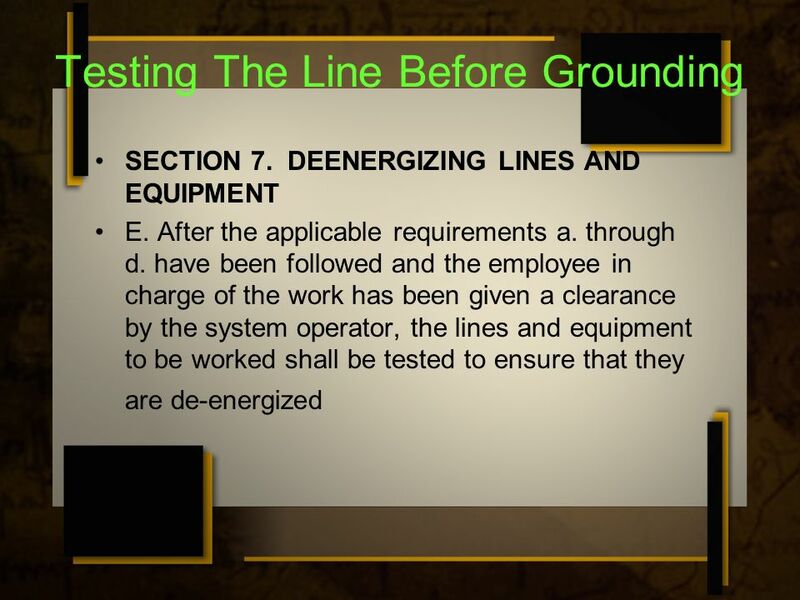 WORKING DIRECTLY ON ENERGIZED CIRCUITS WITH RUBBER GLOVES AND RUBBER SLEEVES 3.Prohibitions b.You are not to have in your possession cell phones, pagers, walkie talkies, radios, or any other electronic communications or entertainment device while performing hot line work under any circumstances. If you have one of these devices with you, turn the device off and leave it in the cab of the vehicle. Download ppt "Remind Me To What? Presented by The Iowa Association of Electric Cooperatives." Best Practices: Rubber Insulating Gloves and Sleeves while Performing Distribution Power Line Tasks via the Live Line Tool Method. Lockout & Tag Presented by Name Title Date. 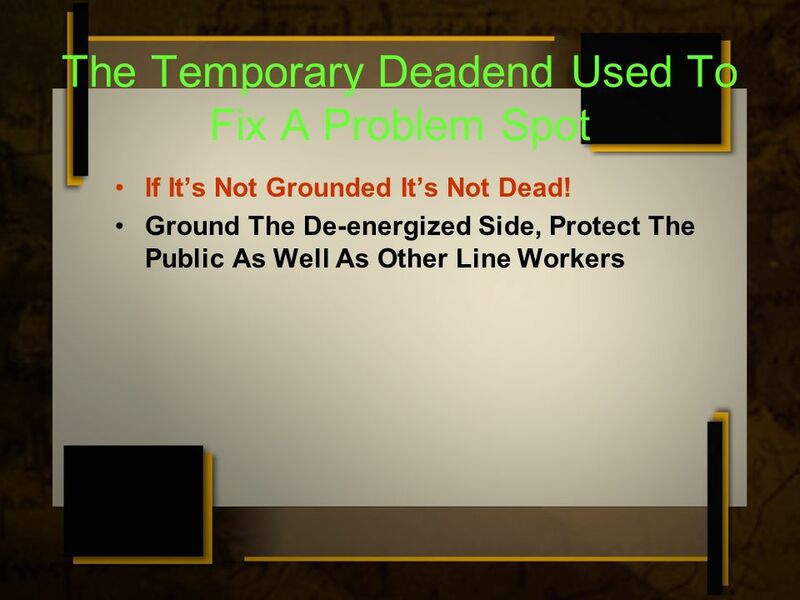 Course Outline Lock-out definitions Legal responsibilities Lock-out procedure Frequent mistakes Removing a.
LOCKOUT TAGOUT Introduction Each year nearly 150 people die because there was a failure to control energy. 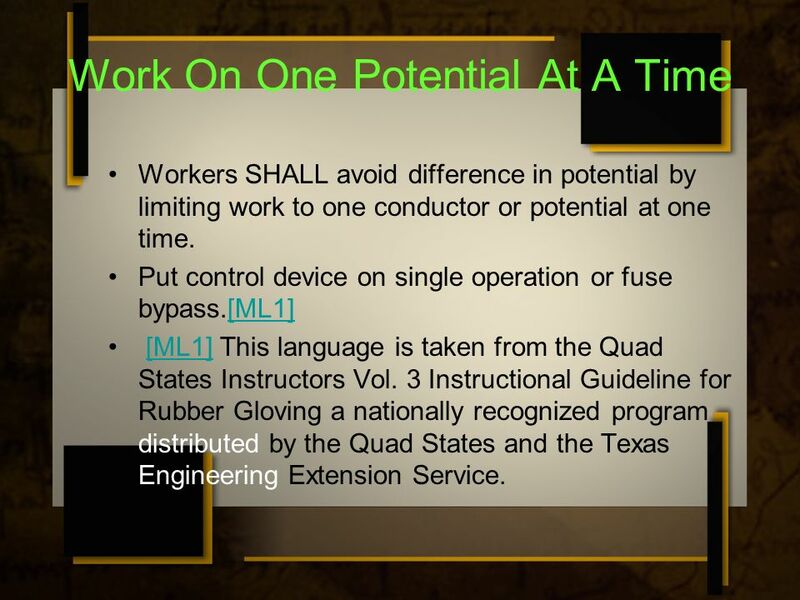 ELECTRICAL SAFETY-RELATED WORK PRACTICES Qualified Persons Those people that have training in avoiding electrical hazards while working on or near exposed. Heavy Equipment  Addressed under 1926 Subpart O: Heavy Equipment  All equipment left unattended at night, adjacent to a highway in normal use, or adjacent. Introduction Most accidents are caused by the uncontrolled release of hazardous energy. Many of these accidents can be prevented by proper lock-out/tag-out. Practice Statement The effective use of Isolate and Insulate equipment and procedures to provide the necessary level of safety when performing Live Line.